While Howard Phillips Lovecraft was closing the final chapter of his writing career, Fritz Reuter Leiber was only beginning to open his own. The year was 1936 and Jonquil Leiber, Fritz’s first wife, sent a letter on her own initiative to Lovecraft, knowing that her husband had been an avid admirer of his work, ever since his first reading of “The Colour out of Space” and hoping that Lovecraft’s presence in Fritz’s slow-paced writing career might be the source of inspiration he so dearly needed. Lovecraft replied promptly on November 2 of that year, the seed of an invigorating correspondence, which lasted till Lovecraft’s passing. Fritz Leiber and H.P. 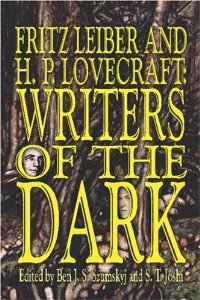 Lovecraft: Writers of the Dark presents Lovecraft’s letters to Leiber, an impressive selection of Leiber’s fiction which shows Lovecraft’s influence, and a selection of Leiber’s essays on Lovecraft and Matters Lovecraftian. Features an introduction by Ben J. S. Szumskyj and an afterword by S.T. Joshi. None yet, feel free to contribute.